Some folks might suggest that seeing the mischevious grin of a denizen of the realm of the dead might be a tad intimidating. Perhaps something that might invoke a few terrible nightmares that will banish away the happy sugarplum fairies of their dreams. We tend to agree with that... however, we also think that being visited by such a great grin is a perfect gift! Who wants to have a bunch of pudgy magic fruitcakes performing a waltz when you can have a wizard of skeletal pranks offering you both tricks and treats!? When you gear up with this officially licensed jewelry from Nightmare Before Christmas, you will feel the haunted presence of Halloween all year 'round. 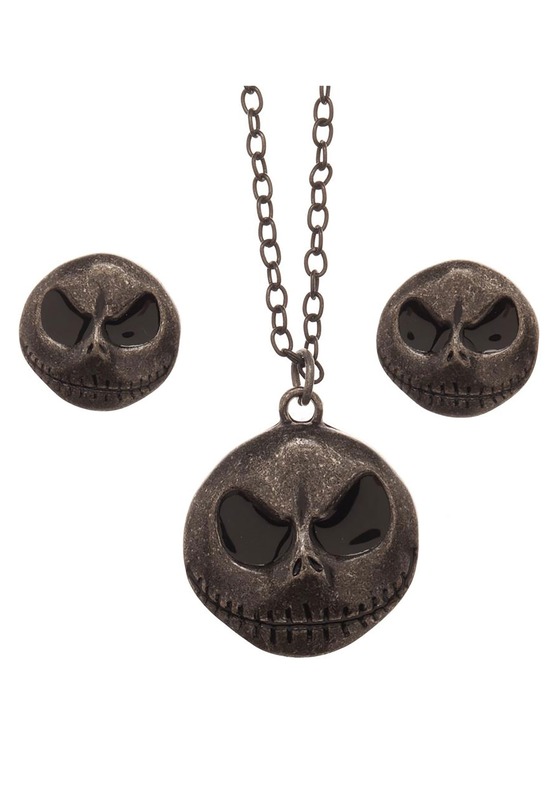 Thanks to the antique silver look of this necklace and earring set, you can be sure that they will fit with any garb you want to wear, while the grinning face of Jack Skellington brings a sense of terrible fun all at the same time! Usually, you have to pass into the realm beyond to get your hands on some haunted gear. Fortunately, with friends like Jack Skellington, we can offer up some amazing and terrifying jewelry without crossing over. Enjoy this antique look and smile just as wide as the Pumpkin King, himself.